SPRUKE Art is a chance to chill out and be creative in a different way. Michelle Verner, Princess Tashiwa, Joanne Butterfield, Pauline Sing, Brenda Meehl, Carrie Silke, Margaret Andrews, Jacki McDougall, Val Hodgson, Debbie Youngs, Debbie Taylor, Sharna Norman, Linda Johns, Salli Chmura, Tanya Dettloff, Louanne Oakes, Holly Shipston, Laya Skelly, Emma Jacobson, Anne Gerber, Marion Carol Johnson, Rosa Huddy, Chakae Carlyle D’Ellencourt, Donna Saunders and Lorraine Mencinsky. Winners if you have not received a notification and your session please check messenger or email Jo at media@spruke.net.au. I need to know if you are coming or your place is forfeited. 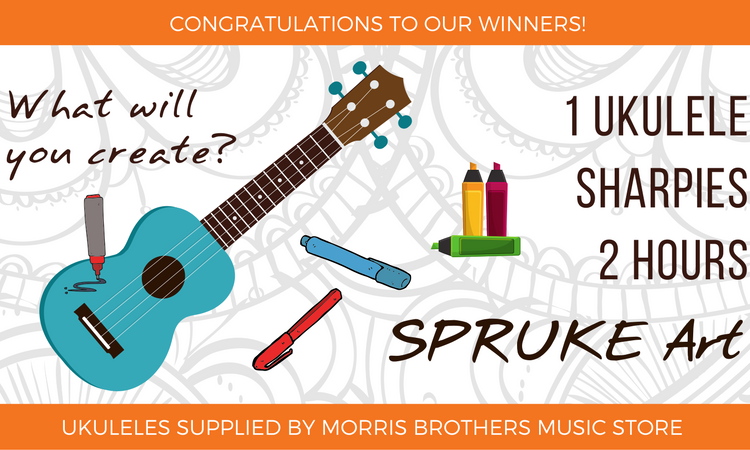 All of our winners receive one Mahalo ‘Rainbow’ Series soprano sized ukulele (valued at $38) to decorate at SPRUKE Art. We’ll take a pic of all the winners and their uke-art at the Festival Selfie Frame and you can find them all by searching for #sprukefestival in Facebook. For all of those who didn’t enter here is your chance to create your own uke-art. There will be a limited number of places available at the start of each session. Everyone who turns up gets a ticket and we’ll draw the winners out of a hat! If you still miss out all is not lost! Zip around to Morris Brothers Music stall in the Music Bazaar and buy your own Mahalo Rainbow uke and you can come use our sharpie pens and join SPRUKE Art. Your design can be as simple or complex as you like… just as long as you can complete it in 2 hours! Find the SPRUKE Art activation at the entrance to the festival on Ernest Street opposite Cordoba Cafe Stage (Espresso Plus). SPRUKE Art is bought to you by Brisbane Ukulele Musicians Society Inc (BUMS) and we thank Morris Brothers Music Store who supplied the Mahalo ukuleles.